Blaze Media Pro is powerful, all-in-one media converter, editor, burner, and ripper software application supporting all popular media formats, audio and video conversions, audio CD ripping, video construction, video decompiling, audio editor and recording, audio and data CD burning, video CD (VCD and SVCD) burner, video DVD burner, video editor and movie editor (AVI, MPEG, WMV, etc. ), MPEG encoder and decoder, the ability to convert (record) MIDI to MP3, WAV, WMA, and OGG, convert DVD audio to MP3, WAV, WMA, and OGG, DVD ripping, batch video processing (over 30 supported processing operations), video capture, AVI MPEG WMV video joiner, video compressor, media management, audio and video playback (including full playlist support), and much more! The converter features are easy to use, yet very powerful. Both audio and video formats can be converted. Supported audio converter operations include CD, MP3, WAV, WMA, OGG, MPEG-4, AIFF, M4A, AAC, AC3, FLAC, and ALAC to MP3, WMA, OGG, or WAV; audio CD burner from WAV, MP3, WMA, and OGG, WAV and MP3 Compression, and two-way video conversions among MPG (MPEG-1, MPEG-2), AVI, WMV, MOV, etc. MPEG converter options are available for VCD, SVCD, and DVD compliant output. The MPEG encoder and decoder features are both very fast and easy to use. The audio content of video files can also be extracted and saved to the WAV format. The CD converter module provides a FreeDB auto-save feature, which enables track title, artist, and album information to be dynamically downloaded from the Internet CD Database and used when you want to convert audio CD tracks to WAV, MP3, WMA, or OGG. This feature is fully configurable to use as much or little of the information desired in any preferred order. Of course, this feature can also be disabled for those who do not wish to be connected to the Internet while using the convert CD tracks feature. Blaze Media Pro also features the ability to convert AVI, MPEG, and WMV video formats to Flash. The full-featured audio editor's capabilities include many effects and operations with audio data, such as Amplify, Null Amplitude, Insert/Delete Silence, Insert Noise, Insert Pulse, Insert Sinus, Fade In/Out, Invert, Normalize, Reverse, Delay, Flanger, Vibrato, Stretch, Mix. Mix from File, Paste from File, Paste from Clipboard, Copy to Clipboard, Delete Selection, Save Selection, Zoom, Convert, Undo, Redo, Cut, Copy, Paste, Crop, Filters (Band Pass, Low Pass, High Pass, Low Shelf, High Shelf), Input/Output Volume Control, Audio Information Read/Write, and much more. Furthermore, the audio editor can be used for audio file recording from any available source (such as cassette; record player; phone line; TV tuner audio; CD player; line-In; auxiliary; microphone; wave-out; and wave-out mix) as well. The audio recorder also provides a solution to convert MIDI to MP3, WMA, WAV, or OGG. Recording can be saved directly to all supported formats, including MP3, WMA, WAV, OGG, and more. Advanced Audio CD burner features support the ability to burn audio CDs from MP3, WMA, WAV, and OGG files as well as burn data CD containing any type of files desired. Powerful capabilities include very fast and efficient multi-threaded recording; highly compatible with most any IDE and SCSI drives on the market today; multi-session disc support; auto-detect high write speed availability and is fully supported and optimized internally; ASPI manager not required for NT/2000/XP/2003/8/10 systems; full re-writeable disc support; superior data buffering; and much more. 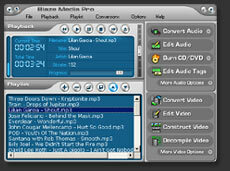 Blaze Media Pro also features a powerful data CD burner. The software allows you to burn data images on-the-fly; no need to create an image on the hard drive first. Therefore, very little disk space is required to use the data CD burner. For data CDs, existing ISO images can be imported from other sources, and the software can also write ISO files for external use. Audio CD creation offers such options as caching data locally to prevent the possibility of errors on slower systems for maximum compatibility. Test-mode burn is also supported to verify success without having to risk a wasted disc. Audio CD track manipulation is very easy and intuitive as well. You can quickly and easily rearrange tracks, remove any unwanted tracks, erase CD-RW discs, add a complete path of files to the list at once, and more. Blaze Media Pro features a complete and powerful digital video editor as well for AVI, MPG (MPEG-1 and MPEG-2), WMV, and ASF formats. The video editor allows you to edit, delete frames, delete selection, add audio to video files or replace existing audio in video files, and trim any desired portion of your video and audio content. You can add movie editing effects and titles, make color adjustments, export frames or audio selections, crop the video, flip, mirror, rotate, resize, stamp, adjust audio volume, and much more. WAV, WMA, and MP3 audio files can be inserted into the video or extracted from the video; and BMP, GIF, JPG, PCX, PNG, RAS, PPM, TGA, and TIF are the supported image formats that can be inserted or extracted. The software's video capture feature can even be used to record video from DVD, and save to AVI or WMV, which can then be edited also. Blaze Media Pro supports all popular multimedia formats for playback, including MPEG Layer-3 (MP3), MPEG Layer-2 (MP2), OGG Vorbis (OGG), Active Streaming Format (ASF), MPEG Video (MPG, MPEG, MPE), Windows Video (AVI), Windows Media Audio and Video (WMA, WMV), Apple QuickTime (MOV, QT), Windows Audio (WAV), Audio CD (CDA), MP2 (MPEG 1/2 Layer-2), VOX (Dialogic ADPCM), RAW audio (PCM, A-LAW, U-LAW), MPC (MusicPack), G.726, G.723, G.721, Video CD (DAT), Media Playlists (ASX, WAX, M3U, WVX), MIDI, AIFF, AU, SND, and more! For video formats, advanced zooming and full-screen modes are supported. The video window is freely resizable, allowing precise zoom adjustment. Playback speed and position control are also supported. The playlist editor gives you the ability to create your own symphony of favorite songs and videos for your listening and viewing pleasure. You can combine both audio and video files within the same playlist. Since Blaze Media Pro supports all popular formats, the creation of playlist(s) is limited only by your imagination. Complete drag and drop support, audio (MP3, WMA, OGG, etc.) tag editor, full FreeDB capabilities, and versatile preferences (for maximum control) add in making Blaze Media Pro the powerhouse all-in-one converter, editor, burner, joiner, and much more multimedia solution! Blaze Media Pro can be downloaded as a free 15-day trial version. Click here to download Blaze Media Pro or order the trial version CD-ROM. • Optional CD Writer (for creating CDs). Blaze Media Pro is a true all-in-one solution. It is packed with an incredible amount of features, including AVI editor, MPEG editor (MPG editor), WMV editor (video editor), MP3 editor, WMA editor, WAV editor, OGG editor (audio editor), MPEG encoder, MPEG converter, AVI converter, MPEG decoder, AVI converter, WMV converter, MP3 converter, WMA converter, WAV converter, and much more. It's perfect if you're looking for MP3 software, VCD software, MPEG software, or AVI software. It can convert AVI to MPEG, convert MPEG to AVI, convert MP3 to WAV, convert WAV to MP3, convert WMA to MP3, convert WMA to WAV, convert WMA to MP3, convert WAV to WMA, convert MP3 to WMA, and will act as a MP3, WMA, MPEG, and AVI compressor/decompressor. The MP3 converter offers many advanced features...so much more.